Feeding grain to cattle is a totally wrong practice, but sadly it is increasing nowadays. However, thanks to the researchers who are bringing out the hazards of feeding grain to the cows instead of grass and creating more and more inclination towards grass fed beef, that society will remain safe at least to some extent from the dangers resulting from consuming meat of grain fed cattle! The grazing animals like cows, sheep, etc. 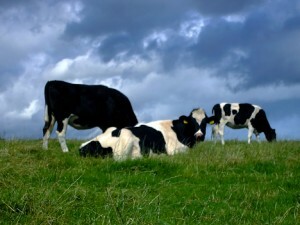 are particularly created by the Nature to feed on grass and so their stomach is made so! And we should eat them because we cannot eat grass directly, as our stomach is not made for digesting grass, though there are a lot of health-giving ingredients in grass! The tradition of grass fed beef changed gradually to feedlot about seventy five years ago, when it was clear that the later is a faster method to make the cow full of meat! When the cattle used to be brought to the slaughterhouse about 75 years back, they used to be 4 to 5 years old, and now they are just 14 to 16 months old! This is the magic of hoards of corns, protein supplementation, growth hormones and antibiotics! They can make a calf of birth weight of 80 pounds to 1,200 pounds in less than a year. But when we look deeply in this magical process, we will find that it is harmful not only to the animal, but also to those who eat it. Firstly, the grains create such a huge amount of gas in the ruminant stomach, that it can even kill the animal. Normally in the stomach of a grass fed cow, profuse amount of gas is created; but it is given out by belching during the process of rumination. When the cow is fed on corn, which is full of starch and very insufficient amount of roughage, the process of rumination itself is hampered! A coating of frothy slime is created in the stomach which traps the gas, due to which the rumen swells like a balloon and presses against the lungs of the animal, which can suffocate the cow, if immediate measures are not taken. Other hazard that the corn diet creates is the acid. The rumen has neutral pH under natural conditions. Corn diet makes it acidic. This may even kill the animal, but mostly makes it sick. Such a sick animal tends to go off its feed, salivate excessively, pant, paw at its belly and eat dirt. Because of this, diarrhea, bloating, ulcers, and liver diseases arise along with a generally weakened immunity, which in turn makes the animal vulnerable to any dangerous disease like pneumonia or feedlot polio. Some of you may be indifferent to all this and may say that ultimately the animal is to die in the slaughterhouse, so, what’s the big deal! But the real hazard is next to this and it is the hazard to people like us eating animals undergone these feedlot-related consequences. As these corn-fed animals are continuously loaded with antibiotics, a new generation of antibiotic-resistant bacteria arises, which, after we consume the animal’s meat, create their characteristic diseases, in us and even the most effective antibiotics cannot kill them. So also, the grain on which the animals are fed is highly responsible for producing the dangerous E. coli bacteria in the stomachs of grain-fed cows, which has been turned unnaturally highly acidic, a condition favorable for the growth of E. coli. When these cows are eaten by humans, the humans too are infected by the hazardous pathogen. These pathogens are basically adapted to the neutral environment of the rumen of a grass-fed cow, which if enters our body, is killed by the acid in our stomach. But due to the corn diet, the cow’s rumen too turns acidic, and these pathogens survive very well in acidic environment and are not killed by our stomach acid, but ironically can kill us. If nutrition is thought about, there too grass diet is superior to corn diet, because corn diet produces flesh in the cow, which contains saturated fat, whereas grass diet produces a flesh which is less in overall as well as saturated fats. Moreover, the grass fed beef is rich in omega-3 fatty acids, the healthy fatty acids for heart. Another advantage of grass fed beef is, of course, it is eco-friendly, because it is natural. Animal’s dung falls on the ground, nourishing the next generation of grass and the healthy cycle continues. However, you should remember to purchase the grass fed beef, which is organic too. Otherwise it may happen that the animal may have been fed on grass which is grown on synthetic fertilizers. All in all, for a healthy life you should turn at once towards grass fed beef!